Video slot and bonus round slot games are by far the most popular and played game online. A very social and fun board game played especially in pubs is of couse darts. With the compliments of Microgaming, we bring to you the best of both worlds, in the new Bulls Eye video slot game. Associated with slot games are the bars and cherries, and associated with darts is the dart board. Bullseye has them all including the wild or substitute symbol as it is know. The game is played on a single payline for a minimum of 1 coin to 3 coins as the maximum. The full jackpot and bonus board feature will only be paid and activated when playing maximum coins per spin. The subsitute symbol in this case is the dart player. Your payline win will be doubled with one of these symbols, quadruples with two of these symbols, and you will receive the jackpot with three of these symbols. The bonus board feature will be activated with only one boad symbol landing on the 3rd reel, and on the payline. 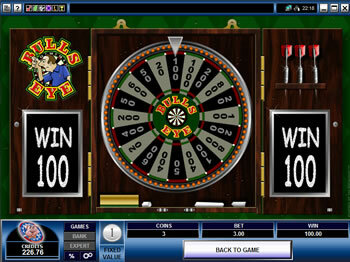 The feature has a second screen giving a wheel of fortune style screen with different values. To play this feature you will spin the wheel, and when it stops the indicator will point to the value of your win. This win will then be addeed to your payline win. Bulls Eye Slot Machine Paylines?